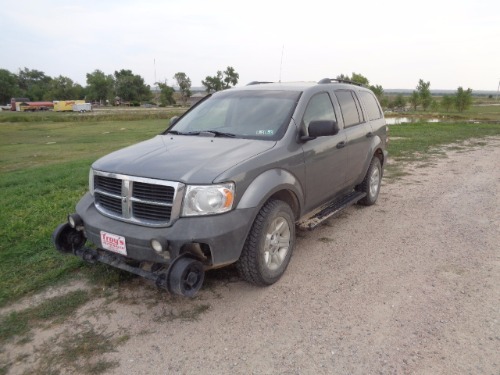 2008 Dodge Durango SXT 4x4 High Rail SUV VIN# 1D8HB38N18F117790 This SUV is equipped with a V8, 4.7; FFV Gasoline Engine and is 4WD. The SUV is also equipped with DMF ( Diversified Metal Fabricators ) Hydraulic Insulated High Rail Gear, that can be operated from inside or outside the vehicle.The vehicle has been fleet maintained, and is up to date on preventive maintenance. The vehicle was well taken care of and driven by a assistant division engineer. Pictures were taken in field. 202,505 approx miles and located in STERLING, CO 80751 * V8, 4.7L * DMF ( Diversified Metal Fabricators ) Insulated Gear * Comfortable Seats ( 5 ) employees * Running Boards * Work Lights * Air Conditioning * Power Windows and Locks --BUYER WILL RECEIVE A 60 DAY TEMP TAG FROM OUR DEALERSHIP. FOLLOWED BY A TITLE IN THE MAIL.